A great sandwich is not possible without premium ingredients, which you will find in abundance at the deli at Acquistapace’s. Every day, our deli is serving fresh, tasty ingredients that you can take home to build your own sandwich. Whether you’re preparing for a party or just getting ingredients for your lunches for the week, you will find everything you need at Acquistapace’s. Your sandwich needs great meat, and Acquistapace’s has you covered. We have all of the classic flavors you want, including smoked an classic turkey, hickory honey smoked ham, black forest ham, and pastrami. We also have unique flavors like Cajun-spiced turkey and London broil roast beef to give your sandwich a unique twist. If you have a craving for chicken salad, you will love our homemade version, which is ready for purchase. 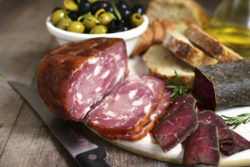 In addition, we have ultra-thin sliced charcuterie featured in our deli. You can request your favorite cured meat sliced while you wait. We specialize in preparing delicious charcuterie boards here in house, so you will not be disappointed! Maybe you have a craving for something hot? We offer hot, juicy rotisserie chicken. Choose from a variety of flavors and bring home a hot-and-ready dinner for your family. Once you have your meat in hand, you will want to find the right bread for it. Our bakery offers a large selection of fresh baked breads, as well as sweets, for you to choose from. Finish out your meal with the perfect selection, because after all a sandwich is only as good as the bread it is on. Whether you prefer white, wheat, rolls, or baguettes, you’ll find it here. Are you ready to explore the flavors and offerings of our deli store? Visit one of our locations in Covington or Mandeville today, or give us a call at 985-893-0593.